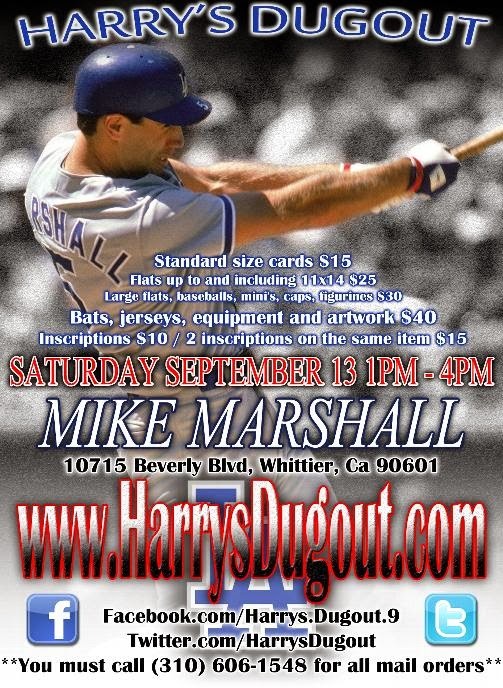 Former Dodger slugger Mike Marshall will be at Harry's Dugout in Whitter to sign autographs for fans. Go here for information. 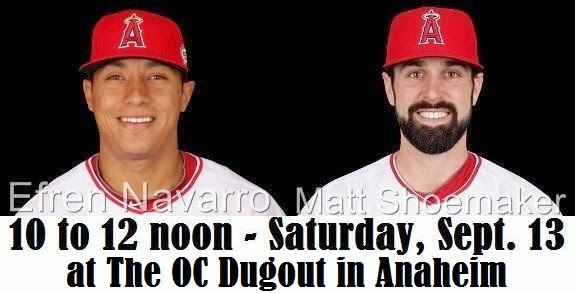 Angel players Efren Navarro & Matt Shoemaker will be at the OC Dugout in Anaheim to sign for fans. 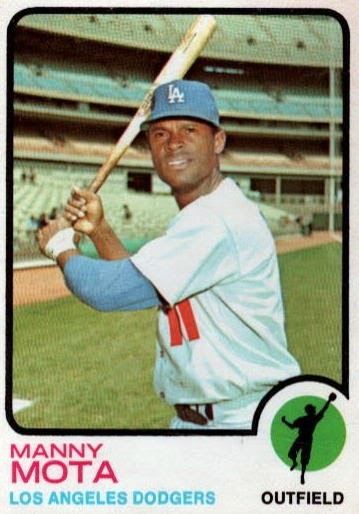 Go here for information and ordering details..
Manny Mota will be at Zendejas Mexican Restaurant/Club in San Dimas on Sunday, September 14, 2014 from 2:00 PM to 4:00 PM. Hat Tip to Roberto at Vin Scully is My Homeboy - who has more information, as well. This coming Monday, September 15 at the San Manuel Indian Bingo & Casino in Highland is the newest installment of "Garvey & Friends." Go here for information. Coming out to talk baseball and swap stories will be Maury Wills, Tommy Davis and Dusty Baker. The $40 cost includes a three-course dinner. "Garvey & Friends" follows dinner. Get tickets at Ticketmaster.com or the San Manuel Box Office. Seating is limited. Buy your tickets early. Holy Moly! A comedy of errors plagued the Dodgers yesterday as some misplayed balls in the second inning resulted in a bunch of runs scoring. Worse yet, it all appeared to rattle starting pitcher Roberto Hernandez. He only went three innings, giving up five runs on five hits, and only two of the runs were earned. Andrew Cashner of the Padres was money. He stifled the Dodgers for seven innings by spreading around nine hits and allowing only two runs on a Adrian Gonzalez homer. The Dodgers certainly got enough men on base, but just couldn't finish the job. 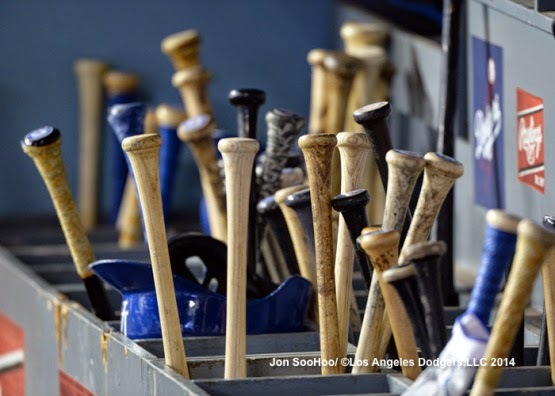 The above photo of the Dodger bat rack was taken by Jon SooHoo/LA Dodgers 2014. Go here to check out more pics of his from yesterday's game. Hopefully, the Dodgers use those bat to drive in some runs tonight. GCRL writes about, "the evolution of the Dodgers' first baseman, part one" through Baseball cards. Via Rich Mueller at Sports Collectors Daily, "REA Pulls Back Curtain on 2nd Fall Auction." 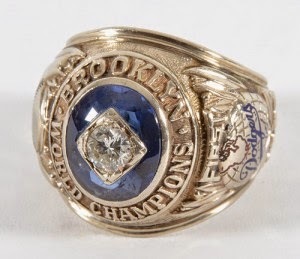 This upcoming auction includes Red Patterson's 1955 Brooklyn Dodgers World Series ring in its original presentation box. He was the public relations director for the Dodgers. See a pic of it on the right. Via Graham Womack at Baseball: Past and Present, "Jackie Robinson’s underrated final season." Via Ron Cervenka at Think Blue LA, "Be patient Dodger fans – Joc Pederson is close." Yeah, I know. I promised no more McCourt stories, but I couldn't resist this one. Via Steve Dilbeck at the LA Times, "Could Frank McCourt really bring horse jumping to Dodger Stadium?" Via Wayne Drehs at ESPN, "Two in a Million." It's all about the day Clayton Kershaw and Mike Trout went head-to-head. It's tantalizing to imagine how it will go: Kershaw will stare at Trout through his black leather glove, kick his right knee so it nearly touches his elbow and then fall toward home plate, planting his right foot and unleashing a pitch from his arsenal. Trout will hold a two-tone 31½-ounce piece of maple behind his head. He'll stare back at Kershaw, lift his left foot, shift his weight forward, turn his hips and in a split second decide whether or not to pull his bat through the zone with power and purpose. Watch the video of when Vin Scully met Babe Ruth at Dodger Insider. Drew Magary at GQ ranks, "The 25 Biggest Sleazebags in Sports."